Excessive phlegm or mucous in the throat is a common childhood symptom. It can be caused by a number of ailments including allergies, the common cold, influenza and infections. 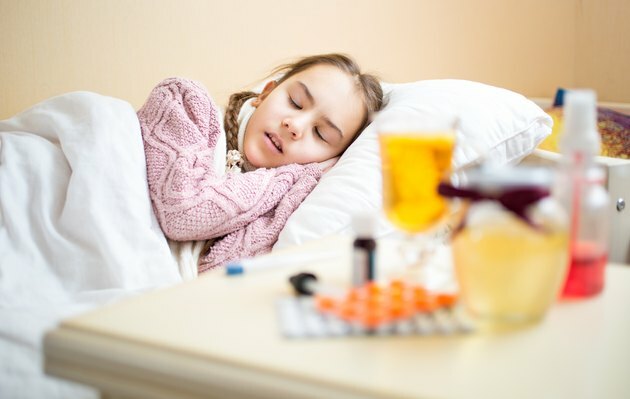 The Food and Drug Administration warns that children under the age of 2 should never take over-the-counter decongestants. Older children may suffer side effects associated with these drugs. Fortunately, there are many effective home remedies children can take to loosen phlegm in the throat. Pediatrician and author William Sears reports that honey may be more effective at breaking up phlegm than over-the-counter decongestants. Darker honeys contain more antioxidants and are more effective. Give 1/2 tsp. for every 25 lbs. of weight. Give your child honey four to five times each day in the correct dosage for her weight. Children under the age of 2 should not eat honey; a microorganism in honey may cause health problems in young children. Never give honey to a child with a known honey allergy. Water is among the most effective decongestants. It helps the body eliminate phlegm and infection more quickly. Additionally, much of the discomfort of a throat infection or cold is due to drying of the sensitive sinus tissue. Encourage your child to avoid sugary juices and sodas and to drink six to eight glasses of water each day. Singers have used cayenne pepper to clear up throat congestion for generations. This remedy is not particularly effective for a dry or sore throat, but if your child has laryngitis or is coughing up mucous, cayenne can work wonders. Sprinkle 1/8 tsp. cayenne in your child's hand and allow your child to swallow it. If your child does not want to eat cayenne by itself, try mixing it with honey for an especially effective congestion remedy. Avoid using cayenne with very young children or children who dislike spicy foods. This remedy is, however, ideal for children who enjoy spicy items. Lemon juice, much like cayenne pepper, is a popular folk remedy and is recommended by "The Mayo Clinic Book of Home Remedies." It works well for congestion caused by the flu, common cold and laryngitis but is ineffective with tonsillitis and strep throat. Give your child a teaspoon full of lemon juice every three hours. Because lemon juice may dehydrate children, ensure that she drinks a full glass of water with each lemon juice dose. What Type of Honey Should I Give My Child for Cough?